The story began in 1886, Edmond Mathey-Tissot, thanks to his talent and the quality of the products he created, made himself and his company became famous in the watchmaking world and won a few prices. 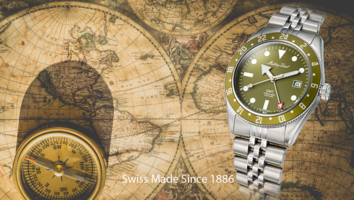 Several prestigious Swiss-brands ordered high-end movements, parts and even watches stamped with their names from Mathey-Tissot. Although the brand has been more discreet in the past few years it hasn't been inactive and is now working on bigger projects to make its name known again. During Baselworld 2019 Mathey-Tissot introduces its new Rolly GMT into the Rolly Vintage family. This new watch completes the collection with its GMT tool to keep track of time in two different countries simultaneously. The Urban collection is stylish, modern, detailed and comes in different eye-catching colors. The Mandy collection is made for ladies and you will find one to be the perfect fit for your wrist. Elegant but not too presumptuous it will suits all your working and evening parties outfits. A timepiece with a long history. This is the new edition of the type 20 which was used by the aviators during WW2. Chronograph, automatic or quartz choose the Type 21 you need. High quality quartz watch, a great combination of chic and modern. Refined and adaptable is the definition of the Darius collection. A range of 7 different colors and 2 special edition that fits both ladies and men.